The two WSIS+10 High Level Event (HLE) outcome documents were applauded in the room in Geneva at about 5:30 pm on the second, and last, day of the High Level Event. The final session was full of governments and representatives of intergovernmental organizations taking turns thanking and congratulating each other and saying how successful the process to develop and approve the two documents had been. The final Vision document includes the Action Lines section, so as well as the rather out-of-date Action Lines text from the original WSIS process (10 years is a long time for the world of ICTs), we now have an updated version. Unlike the version that came out of the MPP process, the version adopted by acclamation yesterday includes more than one reference to human rights (it appears in both the preamble and Action Line C9). The non-consensus parts of Action Line C5 were gone (the MPP participants were stuck over whether to include a reference to cybercrime and whether non-government stakeholders should be added in text promoting greater cooperation between governments to enhance user confidence in ICTs and address ICT security issues). Text recognizing the need to advance gender equality perspectives was back in. I’ve previously described what happened between the end of the sixth MPP meeting and the end of Day 1 of the High Level Event. In summary, after the sixth MPP meeting ended on Monday 9 June and throughout 10 June, Toure had been doing the rounds behind the scenes, trying to overcome the major hurdle that had been preventing consensus in the MPP meetings: the text of Action Line C9. He had been working hard to get Iran to remove their objection to the human rights text in Action Line C9. With this barrier removed, Toure apparently hoped that the remaining items of non-consensus could easily be overcome by deleting the non-consensus text in Action Lines C5 and C8 and by removing the square brackets (which denote non-consensus) on the four paragraphs in Section III, Action Lines beyond 2015: Looking to the Future. On the morning of Day 2 of the HLE (11 June) the Chair of the MPP process, Prof. Minkin, and the Chair of the HLE itself, Mr Helmy, were also visibly approaching governments at the HLE, attempting to encourage them to accept a version of the Vision document that deleted non-consensus items in C5 and C8 and included the non-consensus items in Section III. Some non-government stakeholders were also approached, but equally, many of the non-government stakeholders who’d been in the fifth and sixth MPP meetings were not approached. “I [would like to] inform you that the final document [the Vision document] that we are trying to negotiate here, to be sure that everyone is comfortable with it, is going to be available on the web and will be sent through the Flash so that everyone sees it. We don’t want to rush anybody. And, therefore, I wanted people to see it between now and five o’clock, when we are resuming in the plenary to look at that document. […] We’ll go by the normal ITU rules—which is everybody equally happy or everybody equally unhappy—but I hope that we will make compromises. Here you might not see everything you want, but I hope you will see things you can live with and things that will help other new generations to come. […] You have had a lot of discussions on these issues and, of course, we will not reopen those negotiations [this afternoon]. The copy of the revised Vision document, labeled Proposal by Chairman of WSIS+10 High-Level Event (11 June), was posted to the website within half an hour of the session ending and arrived in my inbox about half an hour after that. To check what changes there were from the MPP-agreed document, I created an annotated copy available here. Let’s clap this thing into existence, shall we? 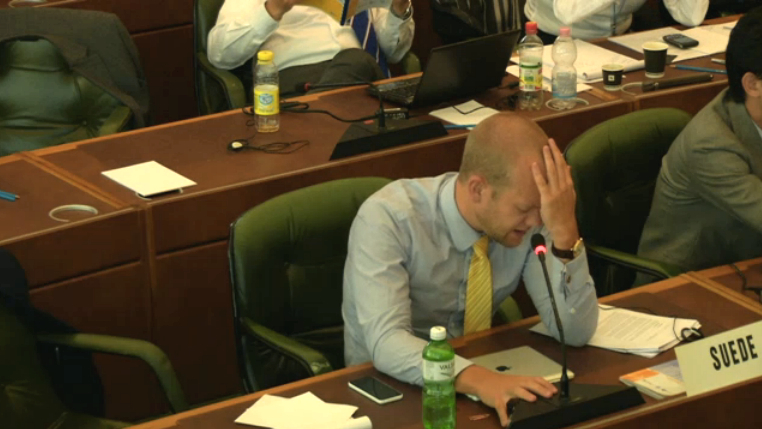 “This is the last plenary session, and we wanted to get the documents […] approved here in this session. As Mr. Chairman said, we have posted the [Vision] document this morning at 12 noon, […] to give a chance to everyone to look at it and be comfortable. There were a few areas of discomfort among members and we tried to iron out all the differences. So the text that you have here was the final text that was then agreed among many members. Since I was not able to physically reach out to everyone, I have asked my officials to help me consult with some of you, and also wait for anyone who would have any problem with the document. This is an almost consensus document. I want to do it in the true tradition of ITU, where we come together and agree without voting. Without winners. Without losers. We call it “everybody equally happy”, or “everybody equally unhappy”. […] We try to be as open and transparent as possible. It is not a perfect document, because […] when you are negotiating, you give some, you lose some. And we want the lowest common denominator. That is the facts of life. I would like to thank all of the administrations who have a very actively contributed into this making it a real document that I think they can live for some time and can give future generations some products that they can rule with. We had a number of negotiations. The last negotiations were on the action lines, C5, C9, C3, C8. We have decided to take out… to leave out… all other points of disagreement. And what we have here are things that we agree on. It doesn’t mean that there are things that each party wouldn’t want to see here. There are some […] things that anybody would want to see added there, but still… since these are points of still [unfinished] discussions, we prefer to go by this way. […] I want to present this document, Chairman, as a whole. I’m not going to run into asking to be done by acclamation, before… If anyone has any strong concern, express it. We don’t do that—make it a fait accompli and then we leave some people unhappy. So I don’t want that to happen. This is a serious business. We all came for that. We are not alone. We are here. There are thousands of people on the web that are looking into this as well, with us, and they are part and parcel of this […] We have constituencies back home that we are going to be accountable to. […] And they are watching over this as well. It’s an important matter and that is why we have to take it very seriously and not rush it. So I present this, Mr. Chairman, a document as a whole. If there are any questions, do it before we proceed for a formal approval of it. I will be ready to answer. There was applause in the room: both documents were endorsed. 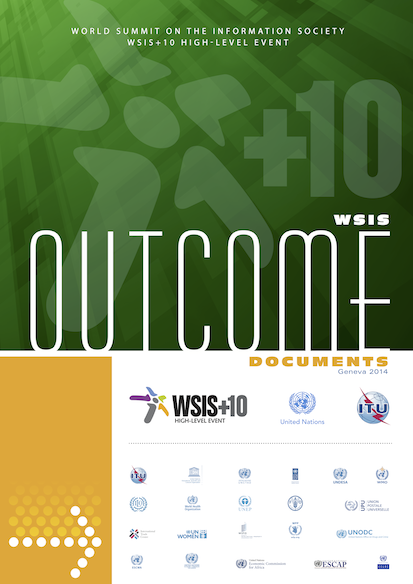 The final approved versions are now available as a single PDF document, WSIS Outcome Documents: Geneva 2014. “I was telling the Minister [and Chair of the HLE] that I was praying all day, all morning, this morning, and I was telling everyone, “Keep your fingers crossed and, if you can, even the legs under the table,” so that we can have something. I was keeping even the toes in my shoes crossed, so that I make sure something happens. And really you made my day. Let me again take the opportunity to thank Prof. Minkin and his team. It is true dedication that he has shown on this effort for many years. I take the opportunity to really, really thank our other two Vice-Chairs of this conference, who used their diplomacy and their know-how […] in dealing with the WSIS preparatory process. I can’t thank enough all of the delegations who have been involved. They have been very kind to us. “Congratulations to all of us for reaching the consensual agreement on two outcome documents. Let me speak with my hat of the former Chairman of the preparatory committee of the Tunis Phase of the World Summit, where decisions on the follow-up and review were taken. The […] distinctive feature of the WSIS process is in its multistakeholder character. […] Not only in implementation—working together, delivering on promises and decisions of the WSIS—but also multistakeholder engagement in defining next steps, what needs to be done, how it needs to be done and how obstacles may be overcome. It just proves that multistakeholder engagement works. It works on all levels. And we should not be afraid of it. It has proven its ability to produce results on occasion of the first review event, which was organized in February 2013, that resulted with a consensual final statement. It’s proven itself today, when the decision was made by consensus in multistakeholder engagement. The MPP Chair, Prof. Minkin then spoke. Then Switzerland as host country of the HLE. Then Toure again. This time naming and thanking a long list of UN agencies also involved in the HLE, as well as some of the key elected officials of ITU. Toure presented ITU medals to the Chairs of the HLE and MPP. The Chair of the HLE spoke a bit more, and then the session was over at 6:15 pm. The whole thing had taken only 45 minutes from the time it began to the time it was over. Despite all the glowing statements by UN agencies and Chairs and Vice Chairs about how successful the development of the outcome documents was, I feel very uneasy about the way the Vision document “reached consensus”. I understand the motivation of all those who pushed so hard to get that last-minute consensus so the meeting could be considered a “full success”. However, I’m rather worried that by resorting to the informal, undocumented and more multilateral techniques to “fix” the non-consensus items, it sets a worrying precedent for multistakeholder processes in intergovernmental settings. The MPP may not have been perfect, but if 15 days of tought discussions between many stakeholders—both governmental and non-governmental—was unable to reach consensus, was it really better to do hard and non-transparent lobbying over a day and a half to push for agreement than just to accept that the issues need further work and may need to be parked for now? Part of the problem with doing “multistakeholder” in (what is traditionally) an intergovernmental setting is that there are hard and fast deadlines for reaching consensus. There is a need to produce outcome documents from meetings. In contrast, multistakeholder processes in the Internet world have historically not been up against hard deadlines. The processes take as long as they take. Even if it takes years to reach consensus on anything. Even if people get very frustrated with how long it can take. Transplanting this way of working into an environment that requires a glossy printed outcome document by the end of a meeting seems to be risking some of the mechanisms and principles of the more open-ended multistakeholder model. How do you successfully navigate the choppy waters between bottom-up multistakeholder processes and top-down, timeline-driven intergovernmental environments? To be honest, I haven’t got a clue. They can co-exist welll… until a hard deadline looms. In my next post, I’ll look at some other cases where similar multistakeholder/intergovernmental collisions have occurred. Stay tuned. I’ve included a lot of direct statements made by officials during the meeting. I’ve done this, rather than summarized the essence of what they said, because I didn’t want to inadvertently colour their statements with my own views of what happened. Where it seemed to be useful, I’ve also added words inside square brackets where it seemed useful to clarify the speaker’s statement. I thought the awarding of ITU medals was rather incongruous, given the event was coordinated by ITU, and not an ITU event. With all the mentions of the “ITU way of doing things” in the session, it’s no wonder so many people think the HLE is an ITU event. All those efforts over the past few months by ITU to stress that the HLE was a UN-wide event have largely been defeated by so many references to ITU-specific processes during the event. As far as I understood it, the May Multistakeholder Preparatory Platform (MPP) meeting ended with no agreement to have a future MPP meeting the day before the WSIS+10 High Level Event (HLE) itself. The Chair did remark that he would be available to discuss the remaining bracketed text on 9 June, but people in the room interpreted it as a joke and laughed. The Chair certainly didn’t try to correct people’s interpretation. But on Tuesday 3 June, two days after the fifth MPP meeting ended in the small hours of Sunday 1 June, an invitation went out inviting people to attend a—surprise!—sixth MPP meeting. The letter, signed by ITU Secretary-General Dr Touré, invited people to an afternoon session to continue the work of the MPP. If a total of 15 days of negotiation across five separate MPP meetings couldn’t achieve consensus, the extra scheduled four hours of discussion on 9 June isn’t likely to make much difference either. The sixth MPP will probably go well into the night, and possibly into the early hours of 10 June too, in an attempt to reach agreement on fundamental ideological differences on issues that realistically can’t be solved in a meeting about ICTs. For HLE participants who hadn’t planned on being in Geneva for the day of pre-events on 9 June, there has really been far too little notice to change travel plans to be able to attend the MPP (hotel availability in Geneva is a particularly difficult issue to overcome at short notice). To make matters more difficult, 9 June is a national holiday in Switzerland (Whit Monday), meaning that most Geneva-based staff at missions and UN agencies will have to sacrifice yet another day of leave (the third in less than two weeks) to attend a WSIS+10 HLE MPP meeting. The meeting itself should never have been called, given the fact that there had been no clear consensus in the fifth MPP to hold another meeting. The 1 June version of the #WSIS+10 Vision draft document does not accurately reflect what many consider to be the status of discussions at the end of the fifth MPP about what should stay in the Vision draft and what should move to a Chair’s report. There is a desire to have that attractive “100% consensus” stamp on all aspects of the HLE outcome documents that will be presented for the government ministers at the HLE to endorse (everyone wants to look good in front of the boss, after all). To try and get the last 5% agreed to, it was worth having one last ditch effort just before the ministers arrive to endorse the outcome documents. ITU, in particular, has invested a lot of time and effort in promoting this multistakeholder process as a sign that it really is embracing the new era of open, transparent and responsive governance. The Chair has also invested a lot in the process. States put a lot of effort into promoting their delegates to be Chairs of various international processes. If the process isn’t seen as a success, the State whose representative chaired the process may feel that they have been humiliated in front of their fellow States. However, as quite a few participants at the end of the fifth MPP had pointed out, although there were still some clear areas of disagreement, on the whole, there had been a great achievement in reaching consensus on the vast majority of issues in the WSIS+10 Vision draft. The remaining areas of disagreement weren’t the result of failure of process, but were the result of fundamental political differences that go well beyond the narrower scope of ICTs and the Information Society. In the end, if the sixth MPP fails in its efforts to breach the current impasse on the remaining Action Lines text, then perhaps the HLE will choose to spin the outcomes of the MPP in precisely this way: as a successful process for negotiating consensus on a large number of issues, with agreement to disagree on a small number of topics that really need to be discussed in more issue-specific venues. I suspect some governments were hoping/are hoping to be able to leverage various parts of the WSIS+10 HLE outcome documents to help support their views on what the final UN-wide review of WSIS+10 planned for 2015 should look like and discuss. But to be honest, given the way discussions have taken place in the past five MPP meetings, with some attempts to roll back to earlier negotiated texts (such as the Geneva Plan of Action) when those documents had been superseded by more recent texts (such as the Tunis Agenda), I suspect that the any future WSIS related events—including the 2015 final review—will also contain a bunch of governments wanting to pick and choose from whichever document texts best suit their views. Whether governments get what they want from the remaining non-consensus sections of the WSIS+10 Vision document or not, they will continue to pursue their larger political goals at future meetings. If anyone tries to suggest that it’s the multistakeholder model that caused “failure”, or “unreasonable” behaviour by other delegates, then it’s just ignoring the larger reality of the situation: with the best intentions in the world, it is never going to be possible for a bunch of medium to low level diplomats and non-government stakeholders, in a meeting that really is only a small event when considered in the context of wider world politics, to find solutions to decades-long ideological impasses. Unfortunately, there was a bit of a mix-up with time, so the Touré-signed PDF invitation said “14:00-16:00” while the HTML web page said “14:00-18:00”. (This is a reason why you should never convene a new meeting with so little time it’s difficult to double check that all your communications are in sync with each other.) A corrected invitation has now been emailed out. The format of the final UN-wide review of WSIS+10 in 2015 was so contentious at the 2013 UN General Assembly Second Committee’s drafting of the ICTs for Development resolution that they simply couldn’t reach agreement on what form it should take. Instead, they agreed to hold a series of informal consultations that were supposed to finalize the event’s modalities by the end of March 2014. That date came and went. At the 17th CSTD Session in mid-May, it was reported that the consultations should lead to agreement amongst States by the end of May. There were consultations in New York on 23 May, but so far, there haven’t been any signs of white smoke indicating a final set of modalities has reached consensus.